Port Tobacco Players Theatre is a beautiful theatre and the perfect place to put on this performance. 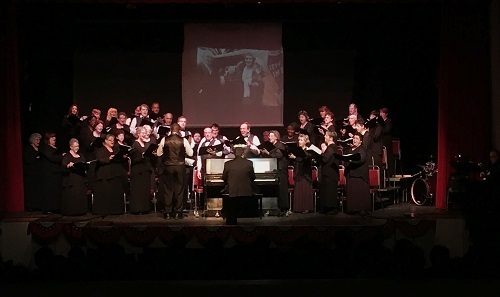 The Chesapeake Choral Arts Society, boasting 54 voices and a 3 man band, really commanded the space and put on a show that captivated the audience. When first reading the title of the show “The End of the Great War”, one might wonder whether the subject matter is grief-filled and heavy. There are moments of heaviness, especially as the show boasts a narration performed by Michael Santana, the head conductor of the choir, giving history to each of the songs and adding additional information as they travel through time on the wings of each note. However, coupled with the stories and history provided are beautiful renditions of many well-known songs from across the world. The collection of music was vast in range and era but boasted many truly uplifting, humorous, and poignant performances. The talent held within this choral group is magnificent, and their voices blended brilliantly to create a sound I shall not soon forget. As they performed these old favorites, I found familiarity in more than I expected. Even if you haven’t heard songs from the wars of world, you’ll know at least a few of these. They have worked their way into cartoons, musicals, TV shows, and more, all without us even knowing. As Santana walks you through the history of these songs, and the events that surrounded their creation, you will learn so much about the experiences that shaped music into what we know today. The stage is set with risers and red cushioned chairs going up towards the top of the theatre. In the center of the stage, suspended over the chairs, hangs a white screen. Almost directly below is a piano, centering this simple set upon the point of the performance; music. As the choir took to the stage, their choice of clothing communicated the elegance of their performance, and they simply oozed energy. The intent with which they watched their conductors was fierce, and you could tell that they truly enjoyed every moment of their performance. Using the white screen, they projected images to capture the original record covers and scores of each song, along with giving some historical images to set the scene of each song. Some of the choir participants also shared stories of family who served in the war, adding to the hilarity of some of the music and the somberness of the historical context to truly capture the range of emotions one may feel during a war. Each of the soloists/groups who performed a song simply nailed their rendition. They brought a new sound or talent to their performance that left me in awe. Some even sang in multiple languages or changed their voices to capture an accent or sound of the original song’s singer. My personal favorite was the whistler; yes, they had a whistler who performed an entire song! If you’ve never heard of a whistler, it is a person who whistles, and this one is a gem! Of course, this magnificent choir is accompanied by an equally wonderful pianist, drummer, and guitarist. My highest congratulations to this three-man band that not only kept this choir on beat, even during the oddly syncopated and opposing parts of some songs, but also maintained a high standard for excellence in their own performance. They certainly added just the right amount of musical accompaniment to this concert! I cannot give enough praise to this group; they created such a brilliant musical experience! I definitely recommend attending their next show to any music lover in the area. This choir contains so many wonderful, talented people with a passion for musical excellence and education. Truly, “The End of the Great War”, performed by the Chesapeake Choral Arts Society at the Port Tobacco Players Theatre, is a magnificent musical experience that you will not want to miss! Advisory: There are some adult themes mentioned in the history of music shared during the performance. Best suited for middle school and up, although younger children will enjoy the music! Running Time: Approximately 2 hours with no intermission. “The End of the Great War” will be performed by the Chesapeake Choral Arts Society at Port Tobacco Players Theatre in La Plata, MD April 14th-15th, 2018. For more information, or to purchase tickets, please see here.